Under a longstanding treaty, the Colorado River irrigates 3 million acres of farmland and supplies water to 30 million people in the United States and Mexico. Between population growth and a decade long drought, the Colorado is under such stress that Western states – desperate to maintain water supplies – want to purify agricultural runoff currently diverted into Mexico. But as The World’s Lorne Matalon reports, Mexico covets that water, because it has given birth to a productive wetland. Columns of moist air hover above still water in the Cienega de Santa Clara, mirroring the desert sky. 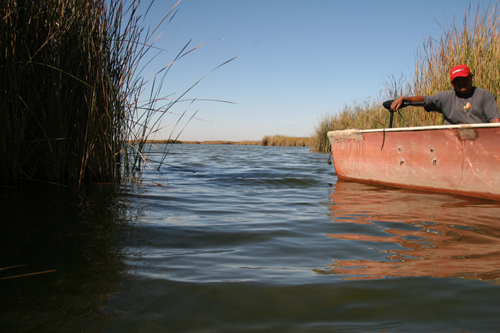 The wetland is an oasis in dry northern Mexico, a haven for birds and fish, some endangered. 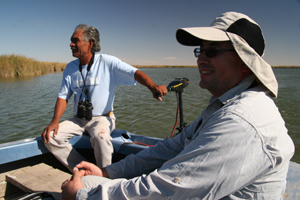 Francisco Zamora Arroyo spends his workdays on the Cienega navigating sliver thin channels that snake through islands of yellow cattails. He’s a biologist from Arizona, who monitors the status of water and wildlife across the wetland’s 63 square miles. But the Cienega is also an accidental oasis. It was created 33 years ago by the diversion of polluted agricultural runoff from farms across the border in the US. Now, though, with water growing ever more scarce in this part of the world, the US wants to keep that runoff and recycle it. 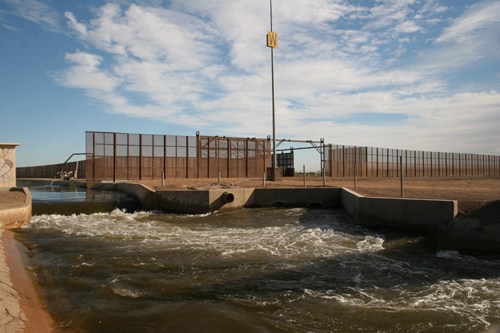 That’s put the Cienega’s future in question, and made it a symbol of the growing water conflicts in the border region. Allocation of water from the Colorado River and Rio Grande is regulated under a 1944 US/Mexico treaty. The two countries have agreed to renegotiate parts of the pact. And under a trial run this year, the flow of wastewater from Arizona’s farms into the Cienega will stop. Instead, it will go to a desalting in plant in Yuma, Arizona. That’s University of Arizona geoscientist Karl Flessa. 100,000 acre-feet is enough water to supply 400,000 households in the US southwest. The Yuma plant will remove the salts that have leached into the water from local farmland and funnel it back into the water supplies of the growing cities of Phoenix, Las Vegas and San Diego. That’s because the US says it will replace the water that now flows to the Cienega. But it hasn’t said how. That worries people concerned about the Cienega. It also worries Mexican farmers. Juan Butron Mendez irrigates seven acres of wheat with the last traces of Colorado water as the river dries up in Mexico. He’s not happy with its quality, but he says it’s better than no water at all. 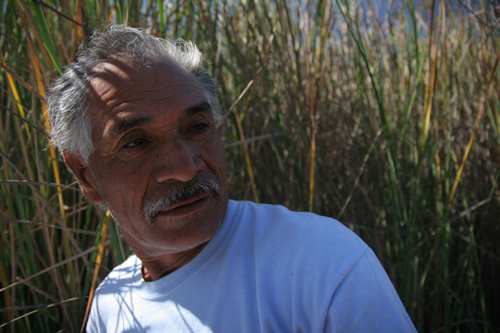 Butron is also a naturalist working to save the wetland. He says the plan to keep that water is the latest example of the US giving Mexico short shrift on Colorado water. The US counters that Mexico violates its water treaty obligations as well. Butron says it’s time for the countries to cooperate, as the treaty mandates. He says competing needs can be met by leaving fields fallow on a rotating basis on both sides of the border. Butron also wants the US to use its own ground water to bolster urban supplies – not the wastewater currently sent to Mexico. But that ground water is already spoken for as well; It’s used to irrigate vast fields across the Southwest. And US farmers have been assured that their water supply won’t change under a new treaty. Like his friend Francisco Zamora, Osvel Hinojosa spends a lot of time on the Cienega. He’s a biologist and a member of the Mexican delegation negotiating with the US. In Tucson, Arizona for example, developers will soon have to supply half of the water used in landscaping from harvested rainwater. Across the border in Nogales, Mexico, watering lawns is only allowed on certain days. And a growing number of people on both sides are recycling “gray water,” for example using water from dishwashers and laundry machines to water their lawns or wash their cars. It’s a start. But Francisco Zamora says saving places like the Cienega will take more than goodwill and local efforts. It will take a comprehensive bi-national agreement. Zamora serves as an advisor to the international commission that’s renegotiating the treaty. He says the process might be the last chance. Both sides say they hope to strike a new agreement within 2 years. Neither side will agree to any specifics in a reworked treaty before analyzing the results of the Yuma Desalting Plant’s trial run In May. With nowhere else to go, the fate of the wildlife that depends on the Cienega de Santa Clara hangs on the outcome of the negotiations. This entry was posted in BBC's The World, Photography, Radio and tagged Arizona, Los Halcones, Mexico, Rio Grande, Sonora, water conservation. Bookmark the permalink.